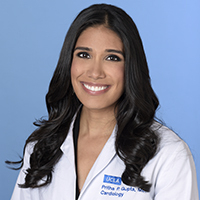 Dr. Pritha Gupta is a cardiologist who practices in Beverly Hills. She also sees patients in the UCLA Cardiovascular Genetics Clinic in Westwood. Dr. Gupta is board certified in internal medicine, cardiovascular disease, echocardiography and cardiac CT. Her clinic interests include women’s health, cardiovascular genetics, precision medicine and preventive medicine. Dr. Gupta received her medical degree from the New York University (NYU) School of Medicine, and completed her internal medicine residency at the University of Washington in Seattle. She completed a fellowship in cardiology at the David Geffen School of Medicine at UCLA, and went on to earn a PhD in molecular, cell and integrative physiology with a focus on cardiovascular genetics at UCLA in 2017. She also received her bachelor’s degree in biochemistry from UCLA. Dr. Gupta grew up in the Midwest, but has called California home for several years. When she is not practicing medicine, she enjoys exploring the great city of Los Angeles. Gupta, P, Buscher, K, Ehinger, E, Akula P, Wolf, D, Tweet, G, Pan, C, Mills, C, Lusis, A, Ley, K. Natural variation of macrophage activation as disease-relevant phenotype predictive of inflammation and cancer survival. (2017) Nature Communications. Jadhav, N, Gupta, P, Calfon Press, M. Right Ventricular Marginal Branch Occlusion After Blunt Force Trauma to the Chest. (2015) Trauma. Sparks, R. Salskov, AH, Chang, AS, Wentworth, KL, Gupta, P, Staiger, TO, Anawalt, BD. Pocket Change: A Simple Educational Intervention Increases Hospitalist Documentation of Comorbidities and Improves Hospital Quality Performance Measures. (2015) Q Manage Health Care. Gupta, P., Fonarow, G., Horwich, T. (2014) Obesity and the Obesity Paradox in Heart Failure. Canadian Journal of Cardiology. Hartman, M., Librande, JR., Medvedev,I. Ahmad,R., Moussavi-Harami,F., Gupta, PP., Chien, WM., Chin,MT. (2014) An Optimized and Simplified Model of Mouse Embryonic Stem Cell Cardiac Differentiation for the Assessment of Differentiation Modifiers. PLOS One. Cubeddu, RJ., Don, CW., Horvath, SA., Gupta, PP., Cruz-Gonzalez, I., Witzke C., Inglessis, I., Palacios, IF. (2012) Left ventricular end-diastolic pressure as an independent predictor of outcome during balloon aortic valvuloplasty. Catheterization and Cardiovascular Interventions. Don, C., Gupta, P., Witzke, C., Kaserwani, M. Cubeddu, R., Herrero-Garibi, J., Pomerantsev, E., McCarty, D., Inglessis, I., Palacios, IF. (2011) Procedural and In-Hospital Outcomes of Percutaneous Balloon Aortic Valvuloplasty in Patients with Severe Calcific Aortic Stenosis and Left Ventricular End-diastolic Diameter < 4.0 cm. Catheterization and Cardiovascular Interventions. *Kang, E., *Ponzio, M., Gupta, P., Liu, F., Butensky, A., Gutstein, DE. (2009) Identification of binding partners for the cytoplasmic loop of Cx43: A novel interaction with β-tubulin. Cell Communication and Adhesion. *These authors contributed equally. Kontogeorgis, A., Kaba, A., Kang, E., Feig, J., Gupta, P., Ponzio, M., Liu, F., Rindler, M.,Wit, A., Fisher, E., Peters, N., and Gutstein, DE. (2008) Short-term pacing in the mouse alters cardiac expression of connexin43. BMC Physiology, Published online 2008, May 6. Marmorino, M., Gupta, P. (2004) Surpassing the Temple Lower Bound. Journal of Mathematical Chemistry 35, 189-197.